On Christmas Day, Shiner got to open her December PetBox. She received her PetBox a few days before Christmas, but we decided to save it until Christmas to open up. To Shiner's delight, there were a couple of toys, treats, a cleaning product, and more. 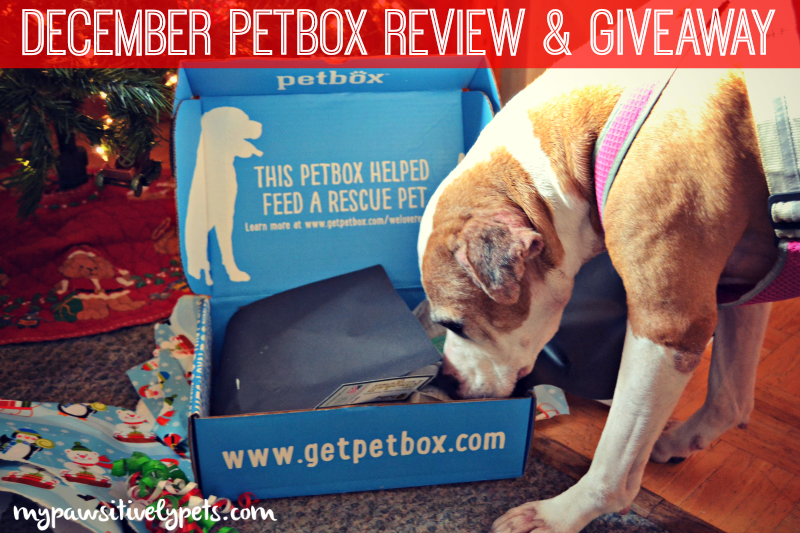 For those of you who are not sure what PetBox is, it's a monthly subscription box for your dog or cat. Since Shiner is a PetBox Spokesdoggy, we always receive a dog PetBox filled with goodies to share and one to give away each month on the blog. Merrick Lil Brush Bones - These are natural, grain-free and gluten-free premium dental chews for dogs. Shiner has tried a similar dental chew from Merrick in the past, but not these specific ones. Merrick is one of our favorite brands so we can't wait to try these out. Puppy on Board Car Sign - You've probably seen those signs that say "Baby on Board" hanging in car windows. Well, here's one for your dog! The sign is made by Puppy in Motion. Old Mother Hubbard Jingle Jangle Dog Treats - This is the second time Shiner received some Old Mother Hubbard dog treats in her PetBox. The Jingle Jangle treats are crunchy and in the shape of cute little stars and Christmas trees. Yum! Flingball Dog Toy - This dog toy is made by BallBoy and it's an eco-conscious, durable, tennis ball toy. It's a tennis ball on the end of a hemp rope with handle to make it easy for throwing or tugging on. 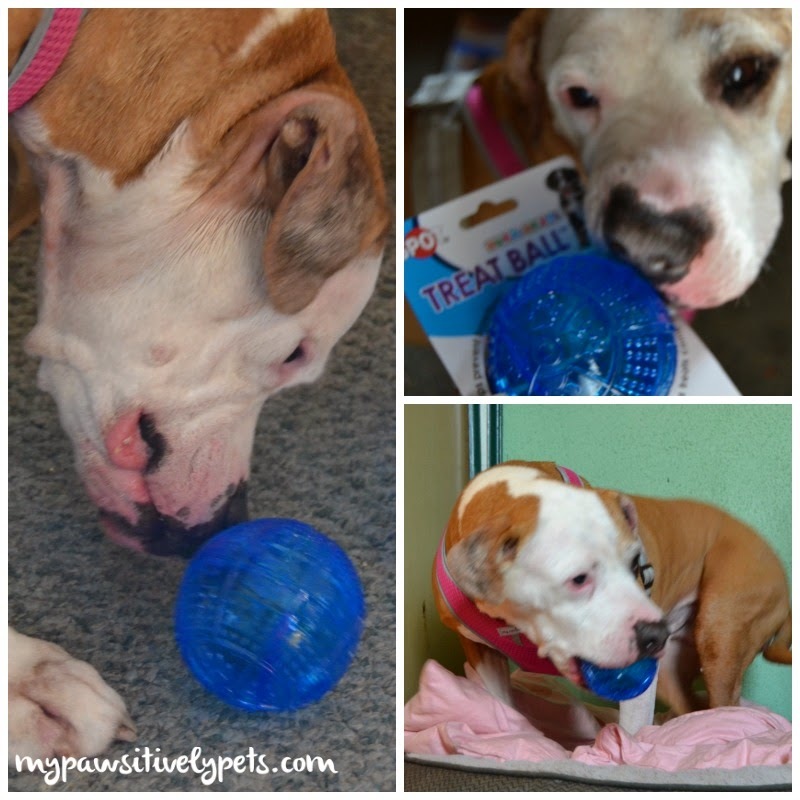 SPOT Treat Ball - This toy is Shiner's favorite this month. It's a durable treat ball with small slots to add treats or kibble. She rolls the ball around on the floor and paws at it to make treats fall out. This toy keeps her occupied for quite a while and we've been using it every morning with some kibble. Sadie's Sweet Pawtato Chips - This is a small treat sample from Pawsitively Wholesome. Shiner thinks these treats are quite tasty. They are a little crunchy and a little chewy. PawGanics Toy Cleaner - This is a fragrance free toy cleaner that is "tough on dirt, drool, & grime" but doesn't leave any harsh chemicals behind. Right now, we are using several other cleaning products from PawGanics and I'm amazed at how well they work. I've been using them to clean just about everything in my house. If you think PetBox looks like a woofing good time, you can order one for your dog or cat at www.getpetbox.com. Use the special discount code "PAWSITIVELY" to save 10% on your order. This giveaway will end on January 6th at midnight Central Time and is open to US residents ages 18+ only. Good luck! 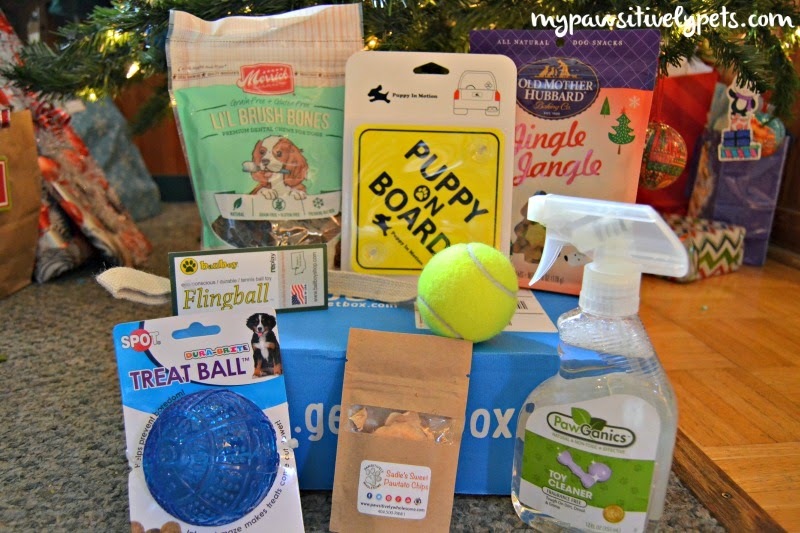 As a PetBox Spokesdoggy we receive a PetBox at no charge each month in exchange for a fair and honest review on our blog. All opinions expressed here are our own. This post does contain affiliate links. My pets got a new friend - a stray cat that showed up at my house. He's going to the vet today to get checked, so he can move into the house if he's okay. I have eight dogs, including two rescues,.... They received lots of new toys, yummy treats and another bed to add to their collection around the house. My dogs love trying new treats and getting new toys so they woild enjoy getting this in the mail. They seem to somehow always know when doggie mail arrives! Thanks for the Chsnce to win. My Pugs Olivia nad Jaxon made out for Christmas. They got Roofles from RedBarn INC, Zukes. Lots of Zukes, Lots and lots of other treats but that is their two favorites. They got some Chuck it toys, Honest Pet Toys, Hyper Pet stuffless raccoon, Nylabone Chewie, a couple other chew toys. Now ask me how many are still with us. LOL. Luckily Hyper pet Stuffless is awesome and still standing, a couple of the Chewies are gone. The Honest pet that were stuffed are now gone. Anything stuffed does not last long in Jaxon's Hand. They also got a Puzzle toy from Nina Ossoman I think how you spell her name. They are figuring it out slowly. Jaxon gets frustrated and goes into just destroy it mode. LOL They did have a good Christmas though. They got some turkey and sweet potato as a special treat. I have to say a lot of the above was from great contest they have entered as funds are tight and that how I was able to give them a good christmas. Despite my best efforts, puppy got stressed but he handled it well with quiet areas, getting extra playtime outside and then some calming rudimentary T-Touch work. Chew toys were abundant and a large orange Chuck-it will be hard to lose but his 10 inch Tug-n-Toss reigned supreme. This box looks like it was filled with lots of awesome little things. The treat ball is a favorite for my dog Charlie too. She does everything in her power to get the last of the treats out of there, it is def fun to watch. I have never thought about getting a toy cleaner but that is also because Charlie usually destroys everything before it can get too dirty, but I can imagine it would do wonders for wandering dog odors, I will have to look into it. I hope your holidays went as smoothly as possible. My pets didn't get anything this year because I'm in the middle of a move. Schooner and Skipper got lots of balls to play with since we are always losing them. They received Yummy treats! Rocket got a bone, a few toys, and some tennis balls. Of course he's enjoying the new blankets and sheets that I received too. He loves snuggling on the bed with me. Thanks! My kitties got a stocking stuffed with toys and a scratcher. I got my furkids presents. And we kept it simple this year and just did stocking stuffer gifts to eachother. I got a external portable charger for my ipad. Love it. That one sure has lots of goodies Shiner! OMD - that was a great review I have to go back and look in Harley's box and see if he got the Sadie chips! Will have to give you a call later to find out how to set up the give away badge. Love the treats and toys under the tree! Hugs to Shiner! Toys, treats, and chews. Wager's favorite was the replacement Squirrels for his Kyjen Hide-a-squirrel. He doesn't care for the actual log and finding them, but he loves the squirrels themselves. Shiloh's favorite was the giant hedgehog toy. We had a smaller version that's been one of his favorites since he was a puppy, so I knew he'd love this bigger version, and he did! Someone else recently did a post on this same box. It is the most useful one we have seen yet. Some real good stuff in it. Queenie received several toys....2 New Wubbas, Pink Tennis Balls, Kong Flyer and Kong Rubber Ball. i got my dog a new blanket for the couch that she sleeps on and a huge dingo. She is a small dog so the dingo looks huge in size to her. It's one of her favorite treats and she's sleeping with it right now. Tuck came to us a week before Christmas so he was lucky enough to have all new things, but what he likes most is my left shoe. This was my dog's first Christmas with us! We got her a bunch of new squeaky toys and a new stylish pink leash! Wow that's a huge box. What fun! I got some catnip truffles that were 4 different flavors and Pop and I got a DRONE! I want to chase it but he doesn’t know how to fly it. He got his favorite tennis balls and a chuck-it! And lots of treats. My kitty-boy got treats and catnip toys! We him them some treats from the local dog bakery, and cow tails along with some new toys, but his is not spoiled or anything. They got treats, toys, stocked up on food!! The "puppy" got a tough, cloth, squeaky boomerang and the old "puppy" got a chew bone. Both were VERY happy! Treats, chews, a sweater, more treats,more treats! My cat got the arch (can't remember the name...it's As Seen On TV). When she rubs up against the arched bristles they give her a massage. Mike got a glow in the dark frisbee, bags of treats and a new bed (he has three beds in different places around the house. She got some new toys, collars, and winter coats. We got our dog a new bed! So much...tennis balls and treats galore!